Winton, Ryder, Rowntree three of the household names on British Humanitarians stamps. As expected, Sir Nicholas Winton is one of the six people honoured in the British Humanitarians stamp set to be issued on 15 March 2016. 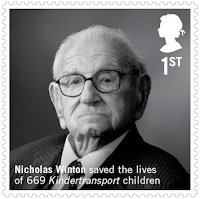 Although his story was not well known until 1988, Winton was then dubbed him the "British Schindler" by the British press. On his death last year a campaign was launched for him to be honoured with a stamp by Royal Mail - the Czech Republic had already accorded him this honour. 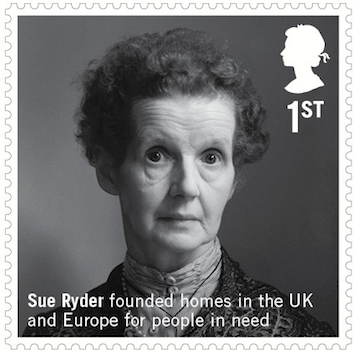 Sue Ryder, Lady Cheshire, is well-known for care homes, hospices, and day care facilities, funded in part by many high street charity shops. 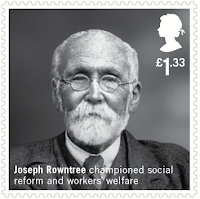 The Rowntree name is best known for the manufacture of chocolate products, but the wealth created by that business established several charitable foundations. Outside his business activities Rowntree is perhaps best known for being a champion of social reform. There are six stamps in the set: larger pictures of the whole set, more biography, and first day postmarks can be found on our website. It's fascinating that all of the "Humanitarians", apart from Eglantyne Jebb, are depicted as relatively old people. Is Royal Mail trying to appeal to a "typical" stamp collector of 2016 or does the designer feel that "A Humanitarian" must have the gravitas that only old age can bestow on him or her? Six stamps for humanitarians, 18 for Star Wars. Sales for humanitarians will be low, although 1st class should get good use. Sales for Star Wars were massive and will continue at this year's London convention, and at the China launch back in January. No contest really, it's money.